Rated 4.5 out of 5 stars.828 total votes. Read beside a buddy or snooze in the sun with this chaise lounge chair set, complete with two reclining chairs and one side table so you have a spot to set down snacks and sunscreen. Crafted with an iron frame, each piece is wrapped in PE wicker to resist rust, UV, weather, and water without any upkeep. A neutral brown hue gives these designs a warm and approachable look, while woven details offer a tasteful touch of texture. Assembly is required. Rated 4.5 out of 5 stars.684 total votes. Designed to live outdoors, this chaise lounge is constructed from weather-resistant solid acacia wood that doesn't mind UV light beaming down or rainstorms rolling through. Its natural finish is neutral enough for any patio or deck, but this piece is still eye-catching thanks to a curved silhouette and a slatted seat. An extended back allows for support for your neck and head, while a side handle lets you easily move it about your backyard. Rated 4.5 out of 5 stars.238 total votes. Complete your outdoor vignette with this essential seating group, perfect for entertaining beside the pool or under the stars. Rated 4.5 out of 5 stars.3616 total votes. Set up a space to relax poolside with this pair of chaise lounges, a must-have for those sunny summer days. Crafted from polyurethane wicker, this design features a curving silhouette that encourages you to kick back with your latest read. A total of five positons ensure you’ll find the perfect angle every time. Better yet, this pair is weather- and water-resistant, so you can leave them outdoors all year long. Rated 4.5 out of 5 stars.757 total votes. Sit back with a book or snooze in the sun with this chaise lounge chair, featuring an adjustable back that reclines in six positions and lies fully flat. Crafted with a steel frame, this UV- and rust-resistant piece is wrapped in brown all-weather resin wicker with woven details for a breezy and approachable look. Foam-filled cushions with polyester-blend covers round out the design, providing padding as you kick back and unwind. Assembly is required. Rated 4.5 out of 5 stars.107 total votes. Unwind with a cocktail on the patio, work on your tan while reading a beloved book, or flip through your favorite magazine poolside with this versatile chaise lounge. 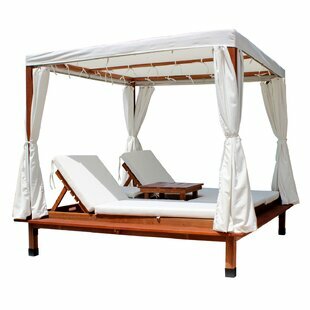 The solid wood frame is made of eucalyptus, a naturally weather-resistant wood, and features two adjustable positions. Cushions are detachable for easy storage when not used. We recommend covering the wooden frame to keep it looking sharp. Rated 4.5 out of 5 stars.116 total votes. 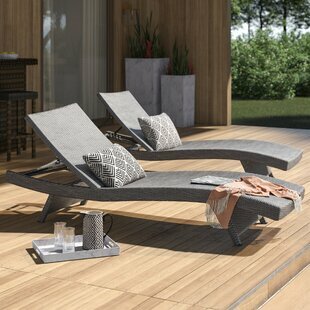 Catch some rays by the pool on this stylish outdoor chaise lounge! Founded on a sturdy steel inner frame, this chaise strikes a clean-lined contemporary silhouette wrapped in tightly-woven resin wicker. Sporting white piping for a preppy touch, a navy blue weather-resistant cushion lines the chaise for extra comfort and support, while a metal mechanism offers six reclining positions. Measuring 14" H x 76 L x 24" D overall, this lounge has a 14" seat height and a 250 lbs. weight capacity. Rated 4.5 out of 5 stars.286 total votes. Deck out your patio in sophisticated style with this chic chaise lounge! Crafted of solid acacia wood in a light stain, this chaise strikes a Scandinavian-inspired silhouette featuring slatted construction on eight tapered legs. Foam-filled polyester blend cushions line the seat for added coziness and support, while six reclining positions offer customized comfort. Measuring 32.68" H x 24" W x 78.74" L overall, this chaise has a 10.5" seat height and a 300 lbs. weight capacity. Rated 4.5 out of 5 stars.1777 total votes. Kick back by the pool with an icy drink and pretend you're in the tropics or snuggle up for a stargazing session with this chaise lounge. Designed to live outdoors, it is constructed from iron and polyethylene wicker that won't mind weathering sunlight and rain on your patio or deck. Plus, it offers a transitional design that works in any alfresco environment with its curved silhouette and neutral solid finish. Rated 5 out of 5 stars.667 total votes. Relax and recline as you read or snooze in the sun with this pair of chaise lounge chairs, designed to recline in five positions or lie fully flat. wicker to A neutral brown hue gives these designs a warm and approachable look, while woven details offer a tasteful touch of texture. Assembly is required. Rated 4.5 out of 5 stars.178 total votes. Sit beside a buddy and soak up some sun with this pair of chaise lounge chairs. Designed to recline in three positions, these low-profile pieces are perfect for sitting poolside or enjoying a backyard breeze as you snooze. Crafted with an aluminum frame in a powder-coated brown finish, each weather- and rust-resistant design features a mesh fabric sling seat that’s treated to ward off wear from outdoor elements. Assembly is required. Rated 4.5 out of 5 stars.101 total votes. Kick back with an icy beverage by the pool or unwind in the shade with this must-have chaise lounge. Designed to live outdoors, it is constructed from weather-resistant acacia wood that doesn't mind UV light shining down or rainstorms rolling through. A polyester cushion tops it off for a touch of comfort, featuring a solid hue and piping trim to complement. Best of all, it folds up for easy out-of-season storage. Rated 4.5 out of 5 stars.15 total votes. Rated 4.5 out of 5 stars.415 total votes. Augment alfresco arrangement with this must-have lounge chair, an excellent spot to kick back and relax with your latest summertime read! 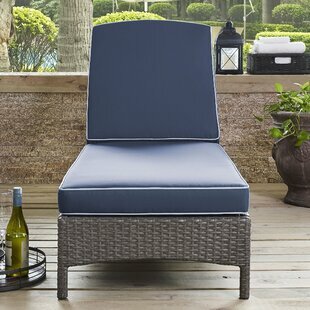 Its inner frame is crafted from powder-coated aluminum and wrapped in a resin wicker weave that’s laid-back yet tough enough to withstand inclement weather, while detachable cushions add both style and comfort. With three reclining poses to choose from, you're sure to find that perfect position in which to soak up the sun. Rated 4.5 out of 5 stars.120 total votes. Is there anything better than relaxing by the pool on a summer day? Doubtful, and to help you enjoy that time, even more, this chaise lounge is here to help. Its steel frame is foldable so it’s easy to pick up and move when you’re on the go, and it also reclines fully to lay flat when you’re ready to really soak up some rays. The mesh seat can support up to 360 lbs., and comes in weather and rust-resistant finish, making it the perfect pick for your outdoor ensemble. Rated 4.5 out of 5 stars.659 total votes. Whether you're soaking up the summer sun solo or entertaining friends alfresco, outdoor furniture is a must. 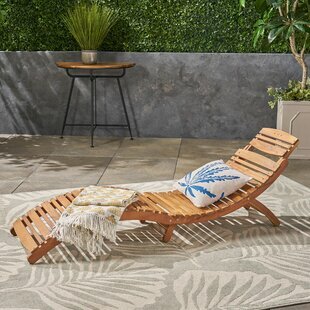 Take this chase lounge for example: designed to live outdoors, it is crafted from weather-resistant materials that won't mind UV light beaming down or rainstorms rolling through, so it's perfect for placing on your patio. Its curved frame allows for contouring to your body and an adjustable back, while cushions lends a touch of comfort. Rated 4.5 out of 5 stars.293 total votes. 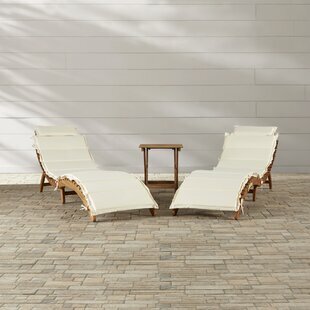 Accent your outdoor seating group with this understated chaise lounge chair, perfect for any patio or poolside ensemble. Made with an iron frame wrapped in a polyethylene wicker brown resin wicker, it features an adjustable design with five reclining positions so you can opt to sit up or lie fully flat. Rated 4.5 out of 5 stars.445 total votes. Lounge the day away poolside or catch up on the latest book club read with this chaise, a must-have for any outdoor space! It pairs a streamlined aluminum frame with mesh panels to provide you with a spot to relax, while a pair of wheels make it easy to cart this design from place to place. With five reclining positions and weather-resistant properties, it’s a perfect pick for using year-round. Rated 4.5 out of 5 stars.368 total votes. Ensure your backyard is equipped for afternoons spent in the sun with this set of four adjustable chaise lounges, designed to recline all the way back. Crafted with a curved iron frame that supports up to 300 lbs. A versatile hue helps these understated designs blend with most color palettes and aesthetics, while their stackable design makes storage easy during chilly months. Rated 4.5 out of 5 stars.52 total votes. Perfect for sitting poolside or snoozing in the sun, this pair of chaise lounge chairs lets you relax and recline beside a buddy in any outdoor ensemble. Crafted with an iron frame, each piece is wrapped in PE gray wicker to resist rust, UV, weather, and water without any upkeep. Woven details give these designs a breezy and approachable look, while foam-filled cushions with removable solid-hued covers provide 1.5" of padding to make these seats even more inviting. Rated 4.5 out of 5 stars.46 total votes. Rated 5 out of 5 stars.29 total votes. Rated 5 out of 5 stars.191 total votes. 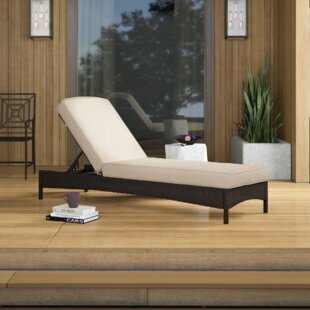 All-weather resistant: this chaise is durable enough to withstand rain wind and exposure to the sun for year-round use.Made of all-weather resistant pe rattan and rust-resistant steel frame, featuring sturdy construction and durable use. Multifunctional use: perfect for the pool, balcony, garden, sandy beach, outdoor recreation place, and other suitable places. Give people a good sense of visual design. Rated 4.5 out of 5 stars.1480 total votes. Rated 4.5 out of 5 stars.49 total votes. Summer days are for fun in the sun, and who doesn’t love to lounge by the pool in nice weather? If you do, this chaise lounge is the perfect pick. Crafted from solid rubberwood, it boasts a slatted design, and comes perched atop two back wheels for easy mobility. Awash in a neutral, weather-resistant finish, this piece is the ideal addition to your outdoor ensemble, and easily blends with your color scheme. Plus, it comes backed by a one-year warranty. Rated 4.5 out of 5 stars.44 total votes. Showcasing a wicker base and inviting polyester cushion, this essential reclining chaise lounge adds resort-worthy style to your alfresco ensemble. Founded atop a powder coated steel frame, it's topped with a resin wicker body and cushion. Pull out this design on sunny days to work on your perfect tan, or use it to offer party guests extra seating by the pool. Rated 4.5 out of 5 stars.89 total votes. Create a clean-lined modern oasis poolside or on the patio with this pair of angular Lacon Mesh Chaise Lounge Set. The gray mesh sling-style seat cradles your body, while six reclining positions offer customized comfort. Rounding out the design, two wheels make it easy to follow the sun around the deck or bring the chaises inside for the winter. Rated 4.5 out of 5 stars.41 total votes. Perfect for sitting poolside or snoozing in the sun, this set of four chaise lounge chairs lets you relax and recline beside loved ones in any outdoor ensemble. Each piece is wrapped in PE wicker to resist rust, UV, weather, and water without any upkeep. A neutral brown hue gives these designs a warm and approachable look, while woven details offer a tasteful touch of texture. Assembly is required. Rated 4.5 out of 5 stars.111 total votes. Rated 4.5 out of 5 stars.128 total votes. Rated 4.5 out of 5 stars.165 total votes. Patio furniture looking a little lackluster lately? Give it a quick refresh with this chaise lounge! Crafted from metal, its frame reclines to three different positions for your convenience. The removable cushion features tufted detailing and bold, piped seams for an approachable aesthetic, while a solid hue allows it to blend with a variety of color schemes. Plus, this product is water-resistant, so it’s the perfect addition to your outdoor arrangement. Rated 4.5 out of 5 stars.240 total votes. Like floating on a cloud, this hanging lounger will add comfort and style to your garden, patio or yard. Boasting sumptuous padding, a comfortable headrest, and a durable, powder coated steel frame, this crescent moon-shaped chair will provide you with hours of rest and relaxation. Rated 4.5 out of 5 stars.423 total votes. Whether you prefer to bring your book to the backyard or sip wine as you soak up sun, you can relax and recline beside loved ones with this six-piece chaise lounge set. Complete with four lounge chairs and two side tables, this weather-resistant set is crafted with an iron inner frame and a multi-brown wicker outer frame that blends seamlessly into your existing ensemble. Each seat can recline to lie fully flat, and all of the pieces fold for easy storage during winter months. Rated 4.5 out of 5 stars.589 total votes. Lounge around in unparalleled comfort and style with this Wicker Chaise Lounger Set. The set comes with two lounges and a folding side table. With multiple configurations possible these pieces are easily transferable and fold flat for storage. Spend your days outdoor in luxury with this Wicker Chaise Lounger Set. Rated 3.5 out of 5 stars.11 total votes. This superbly comfortable Rattan Lounger and cushion is perfect for the garden, patio and conservatory or at the poolside and is a perfect complement to this range of furniture. The durable, robust rattan-style fabric is colorfast, UV and weather resistant requires minimal maintenance and the generous matching cushions have removable covers for easy cleaning. The lounger has 4 separate ratcheted reclining positions from upright to flat-down. Rated 4.5 out of 5 stars.513 total votes. Soak up the sun and relax in style with this inviting chaise lounge. A contemporary update on classic designs, this streamlined design is crafted from acacia wood with a slatted seat and swopping lines. The wood is water-resistant and UV-resistant, so no need to worry about leaving it outside all season long. It also features a folding design, so when the time comes to put it away you can easily tuck it into an unused corner. Rated 4.5 out of 5 stars.4 total votes. This 3-Piece Resin Wicker Sunshine Chaise Lounge Set comes with two chaise lounge chairs with cushions and one side table with storage functionality. Powder-coated steel structure wrapped under 2-tone brown resin wickers, paired with polyester and foam cushions ensures you and your family a quality leisure time in the beautiful sunshine. Side table storage can fit your refreshments, books, party supplies, and your other personal belongings. This set will be a perfect add-on to your home patio. Rated 4.5 out of 5 stars.12 total votes. This set of two chaise lounges is sure to impress at your next barbeque. Featuring a wicker seat and back set upon an acacia wood frame with the added bonus of a pull-out side tray, this lounge is sure to impress. With the included one year warranty, you can buy stress-free. Rated 4.5 out of 5 stars.218 total votes. Soak up the sun by the pool or curl up as you gaze at the starry night sky with this chaise lounge. Designed to live outdoors, it is crafted from plastic and polypropylene resin for a weather-resistant design that doesn't mind UV light shining down or a rainstorm rolling through. Its frame is adjustable, offering five different reclining positions that help you get comfortable. Plus, it's available in a variety of colors, so you can choose the one that best suits your deck or patio. These comfortable wicker lounges are the perfect addition to any patio setup. Made with top quality wicker and water resistant cushions, this set of lounges is a wonderful way to stay relaxed this summer and get your tan on. With an adjustable backrest, you can sleep, read a book or enjoy a conversation with a friend or significant other. The possibilities are endless with these lounges. Rated 4 out of 5 stars.6 total votes. Rated 5 out of 5 stars.17 total votes. Snooze in the sun or relax in the backyard beside a loved one with Acad Sun Lounger chairs. Their curved silhouette is designed to support your spine as you recline fully flat, while its folded legs make it easier to store these seats when they're not in use. Rated 4 out of 5 stars.118 total votes. Enjoy a balmy afternoon nap or entertain guests at your next outdoor soiree with this 4-piece rattan chaise and ottoman set. Rated 4.5 out of 5 stars.28 total votes. Relax and read or snooze in the sun with this reclining chaise lounge chair. Crafted from solid acacia wood, this weather-resistant piece reclines in two positions and can lie fully flat. A foam-filled cushion with a beige polyester-blend cover tops this design, providing padding as you kick back, while ties help it stay put. We recommend you store this chair inside or cover it when it’s not in use to keep it looking sharp. Rated 4.5 out of 5 stars.19 total votes. At Wayfair, we try to make sure you always have many options for your home. That's why we have so many outdoor lounge chairs for sale on our site, including outdoor lounge chairs from brands like Mistana and Brayden Studio. We want to make sure when you're looking for where to buy outdoor lounge chairs online, you're getting the one that's exactly right for you, whether that's the Ardsley Reclining Sun Lounger Set with Cushions (Set of 2), the Rebello Reclining Chaise Lounge (Set of 4), or something entirely different and unique to your home. We have thousands of great deals every day with no need for a coupon. There's never been a better time to "Wayfair my outdoor lounge chairs".